I wasn’t absolutely sure until he spoke. I have to say, the chances of coming across the Greatest Living Songwriter in the fruit and vegetable aisle – or indeed, any other aisle, up to and including the meat counter – of our local branch of Morrison’s, might seem astronomical. Indeed, you might consider all of this a tall tale, and I could hardly blame you. And yet there he was, as large as life, and looking for fresh turmeric. By sheer chance, I had been reading recently of the putative merits of the roots of Curcuma longa, but, fearing my show of insouciance was about to crumble, I just shrugged and shook my head. Dylan smiled, like a man happy to find another convert to his latest beliefs. I looked at him. He looked like a scruffy seventy-something with questionable dress sense and the kind of three day stubble that only looks good on the likes of George Clooney. He also, unquestionably, looked the dead spit of Bob Dylan. ‘No, no!’ By this time, we had, jostled by other shoppers in search of various types of root vegetables, ended up in a far corner of the store by the less popular end of the deli counter. Overcome with guilt at upsetting my hero, I outlined to him my early devotion to him, bordering on fanaticism in my student years, now tempered into a more mellow appreciation of his absolute mastery of the songwriting craft. ‘Visions of Johanna,’ I countered easily. ‘Well, I started out on Budokan, but I still think Hard Rain is greatly underrated,’ I said. A passing shopper gave us a curious look as she reached for the barbecue chicken with cheese combo 12 inch, before heading off back towards the soft fruit. ‘Well, things got back on track, with albums like Time Out of Mind. Then Old Nick, he started hassling me about doing American Standards. I mean, those Rat Pack guys – Frankie, Dino, Sammy and the rest – they were his people, man. So I’ve been stuck with doing them ever since. I could tell my time with the Greatest Living Songwriter was coming to an end: mainly by the way he was edging away from me in the direction of the speciality cheeses. I was racking my brains for something short and pithy that would encapsulate my undying admiration for his life’s work, only enhanced now by knowledge of his very real battles with his inner and outer demons. However, he had his own parting statement ready. Nothing to see down here. Not even a crossroads. the video’s location, that well-known Edinburgh establishment the Captain’s Bar. Back when I was a student it was fabled for its early-morning opening hours, designed to catch posties and other workers coming off the night shift. Nowadays, it’s an excellent live music bar, focusing on folk and other acoustic music mainly. Norman is playing a gig in aid of foodbanks on Friday 15th December at the Village, Leith – you might want to go along. Also, on the charitable front, there’s the Red Cross appeal for the Myanmar refugees. A shorter, more tightly edited version of this profile appears on Norman’s own site here. Does the creative spark flare brightest in early adulthood for all of us? Or for some, does the onset of, say, middle age create new impetus, new muses either spiritual or temporal? I’ve been thinking about this for a while, and especially since reading Norman Lamont’s comment on his website that he’s been writing songs for 45 years, but he didn’t start writing good ones till his 40s. Of course, this is in many ways typical Lamontian self-deprecation – I’m sure his twenty- and thirty-something output contains fine material – but my own appreciation of Norman’s work is inevitably coloured by the fact that I first got to know him in early 2011, when putting together a tribute night to His Bobness called Dylan Uncovered. The format was for each artist to do two covers of the great man, plus something else inspired by his work. In Norman’s case this was, inevitably, ‘the Ballad of Bob Dylan,’ one of his best known songs – and written, by my reckoning, long before his forties. I’ll let Norman himself tell you the story of that one, but, for me, his whole performance was one of the highlights of the evening. Partly I just wanted to steal him and his bandmates to be my own backing band! Although they’ve since mutated from the Invisible Helpers to The Heaven Sent, Norman’s fellow instrumentalists in both switch between that folk-rock mix of acoustic and electric bandwidths that, in my head, I mostly hear when I have an idea for songs. Norman’s output is eclectic to say the least, ranging from the folk and rock genres through jazz influences to ambient electronica, but at its core is a body of work that follows that golden thread of songwriting craft from Dylan, Leonard Cohen, through others such as Nick Cave (Norman and his band also played at my next curated night, Cry of the Cave People, and made the Grand Lord of Goth’s songs his own too). In the same post, Norman mentions where he was living at the time of various Cohen album releases, including Rotterdam, London, Manchester, Staffordshire, and latterly, thankfully for us east coast Scots, South Queensferry. 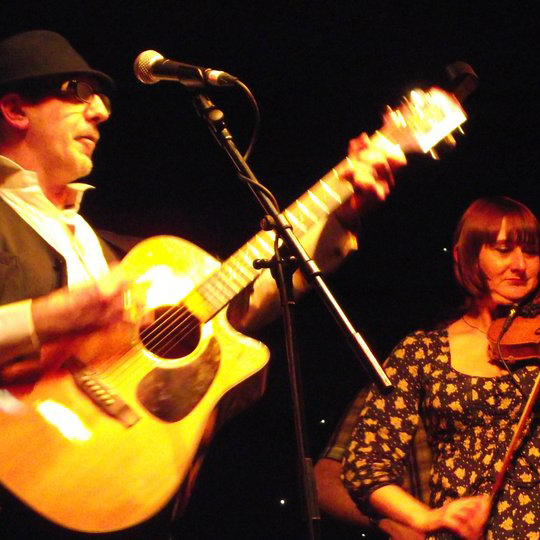 He’s been a fixture on the Edinburgh singer-songwriter scene since 1990. I’ve now seen him perform several times, and been lucky enough to share a bill with him on a couple of those occasions. In person and on stage, what shines through, apart from superb musicianship and songcraft, is the charm, self-deprecation and wit. Characteristically, after the Dylan Uncovered night turned out to be a logistical nightmare for which I, as an inexperienced gig promoter, was totally unprepared, he took the trouble to write and thank me for asking him to play. It was much more than most of the rest of the bill did! A typical Lamont song – if such a thing even exists – will often use storytelling skills to drive the lyric on, whether of the shaggy dog variety as in ‘Ballad of Bob Dylan’ or a tauter form, as in ‘The Last Man to Touch You,’ where the telling detail of the sexual rival’s journey to meet the narrator’s lover ‘he checks his watch, he mouths a song’ unwraps the fierce emotions underneath. One of my favourites from his last album is ‘Not About to Fly,’ recounting an Ayrshire childhood, from the sound of it, well spent. How many other songs begin with a line like, ‘When I was a spy I stuffed some wires in a jam jar/ left it buried by the river bank where it’s transmitting still…’? Musically, the opening mandolin motif leads into some superb violin playing before the rhythm section of (acoustic) guitar and bass underpin the whole; but the song’s flexible enough that the band could perform it equally well with Norman toting his Stratocaster. My perennial question for Norman when I meet him these days – apart from, ‘when’s the next album coming out?’ is ‘why in hell aren’t you far better known than you are?’ It’s a dumb question to ask any artist, but dumb questions can still be valid ones. Perhaps he doesn’t push himself forward as brazenly as it takes. Maybe it is that age thing – after all, if anyone’s going to grab attention in today’s overcrowded Youtube/Soundcloud/Bandcamp melee it’s probably not going to be a fifty-plus singer-songwriter who relies on strong melody and intelligent lyrics, and doesn’t generally pause in the middle to rap over a Limp Bizkit sample. Well, if this blog persuades one more initiate into the cult of Norman Lamont, it’ll have been worthwhile. Let the world go to hell in a handcart – standing at the top of 2017, it certainly looks headed that way – if we’ve got Mr Lamont to help it explain it all, the journey there will seem that much less bumpy. And the good news for all of us is, the well’s showing no sign of going dry. ‘I’ve got so many to finish and so many unrecorded,’ he tells me. Amen, amen, amen to that. Footnote: when putting this profile together, I asked Norman a couple of questions – basically just to get a couple of quotes from the man himself in somewhere. Typically, his responses were so well written and witty they’re far too good to fillet, so they’re printed in full below. When you’re recording an album, do you have a sound (whether it’s Dylan’s wild, thin, mercury sound or otherwise) in mind for the songs? in the case of the band album, using the same people and roughly the same intrumentation for every track. I have to say none of these have been as successful, I don’t think, as the songs that are fully ‘heard’ in my head like I Started A Fire and The Last Man To Touch You. Often when I make them up I’m driving so they have to be quite catchy songs for me to remember them till I get home. By that time I’ve pretty much arranged them in my head. But I’m trying to persevere with the ‘disruptive’ methods. An example of that would be Song of Wandering Aengus from the last album where I had the backing track I’d made for a cover version of someone else’s song, but replaced the melody with a new one and Yeats’ lyrics. Do you release groups of songs as albums as they come chronologically, as it were, or are there a lot of songs that you hold back till they find a right fit? I have the recordings in half-finished states for years, dipping in and out until suddenly one night I’ll get a glimpse of what this or that one needs to make it good. I don’t really think about albums other than ‘have I got enough for one?’ I think those days may be in the past and I’ll just put them out as I finish them. I’ve got so many to finish and so many unrecorded. Name something you enjoy about the recording process, and something you don’t enjoy so much. I love arranging, throwing instrument after instrument on then taking them off again leaving maybe only a bar or two of this and and a trace of that. I hate the software. At first I thought it was Cubase that was playing jokes at my expense but now I realise it’s any software I use. They conspire among themselves to trip me up. They tune into my level of eagerness to get started and plan their malfunctions in proportion to my sense of urgency. An alternative explanation is incompetence, but I don’t buy that. You can also read my interview with Norman which formed part of my ‘songwriters on songwriting’ series right here. – when we started rehearsal I had a bad cold and my voice was a good bit lower. It sounded great. Now I’m back to normal and I’m struggling to reach the low notes!